Bosses in China always seem to come up with newer and more innovative ways to motivate their employees, from making staff crawl on all fours to publicly spanking their buttocks. The latest episode involves a manager of an electrical appliance store in Jinan, Shandong province, who tried to motivate her underperforming sales personnel by forcing them to tear up 100-yuan banknotes. The incident, which occurred on March 22, was caught on video and posted online, where it received widespread criticism. According to the South China Morning Post, the female manager, surnamed Liu, was punishing staff who failed to meet their daily sales quota of 100 deals. In the three-minute clip, five men can be seen standing in a line with their heads bowed, while Ms Liu gives them a "pep talk" for two minutes. After the scolding, she then tells them to take out their money and shouts: "Tear up the notes! Tear them all. Take them all out and tear them!" The men then are seen tearing up the paper notes before throwing the pieces to the floor. As they are doing so, some onlookers appear to warn her that destroying money may be illegal, finance website China Economic Net reported. But she remained unbowed, and said: "Anyone who wants to question me can leave their jobs. Get out!" A manager of an electrical appliance store in Jinan, Shandong province, tried to motivate her underperforming sales personnel by forcing them to tear up 100-yuan banknotes. As they are doing so, some onlookers appear to warn her that destroying money may be illegal, finance website China Economic Net reported. But she remained unbowed, and said: "Anyone who wants to question me can leave their jobs. Get out!" The incident was widely shared on Chinese social media, with many netizens criticising Ms Liu's actions and management style. Ms Liu's intention was to teach her staff a lesson on not wasting the company's paper promotional flyers. 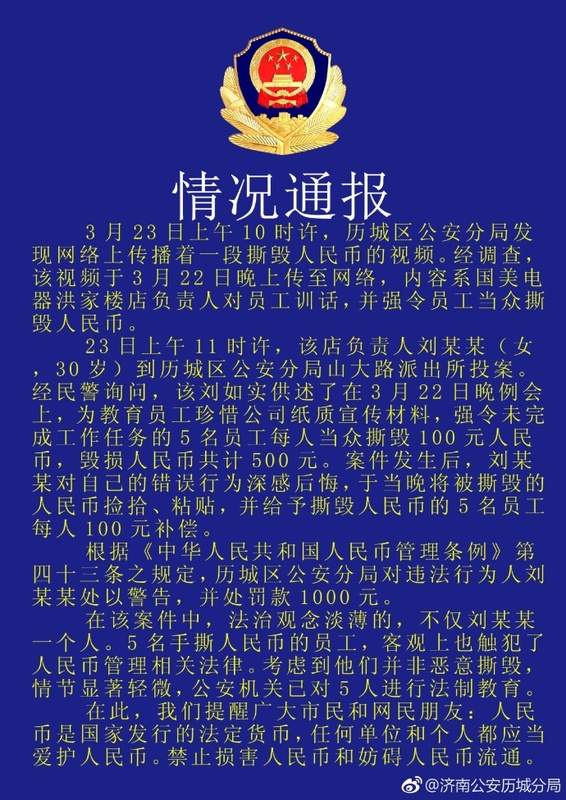 It was eventually brought to the attention of the police in Jinan, who released a statement saying that Ms Liu had been given a warning and fined 1,000 yuan (S$202.45) for destroying banknotes. She could have been fined up to $10,000 yuan under Chinese law, Sohu News reported. She could have been fined up to 10,000 yuan under Chinese law, Sohu News reported. The authorities added that Ms Liu's intention was to teach her staff a lesson on not wasting the company's paper promotional flyers, and that she felt regretful after the incident. She had also given 100 yuan back to each of the five employees involved. There have been various reports of managers in China going to extreme lengths to either punish or reward their staff. While the punishments usually include some form of public humiliation, some bosses have also rewarded high-performing workers in extravagant ways, including giving them luxury cars, and even a night with an adult model.